Kemble Was Actually Just Some Dude | SPACE-BIFF! Hold on. This is the internet. Go look it up yourself, slacks. What I will tell you about is The Battle at Kemble’s Cascade, which mostly — mostly — captures the spirit of those arcade classics. Like the best top-down shoot ’em ups, The Battle at Kemble’s Cascade is about two things. Flying. And shooting. And while that’s an incredibly reductive explanation, that’s how you’ll spend about 90% of your time. I don’t know if there’s a story to the game, because it’s enough to know that your starfighter has to blast its way past a whole bunch of enemy fighters, turrets, and cruisers; dodge black holes, space-mines, and asteroids; and exploit singularities, wormholes, power-ups, and recharge drones (pretty much by flying into them, in case you thought I was contradicting my “flying and shooting” statement) — all before facing down a massive screen-engulfing final boss. And shooting it in the eye/maw/bum. If it sounds messy, well… it is in two ways. The first is said in the voice of an ’80s action hero, along the lines of “It’s gon’ get messy, son!” Which is fun. The second type of messy is a bit less fun, because there are a lot of moving parts to fiddle around with, especially since the map is literally constantly sliding towards your starfighters in classic shmup fashion. In all fairness, Kemble’s Cascade handles this way better than they might have, providing you with handy trays to keep everything in order. 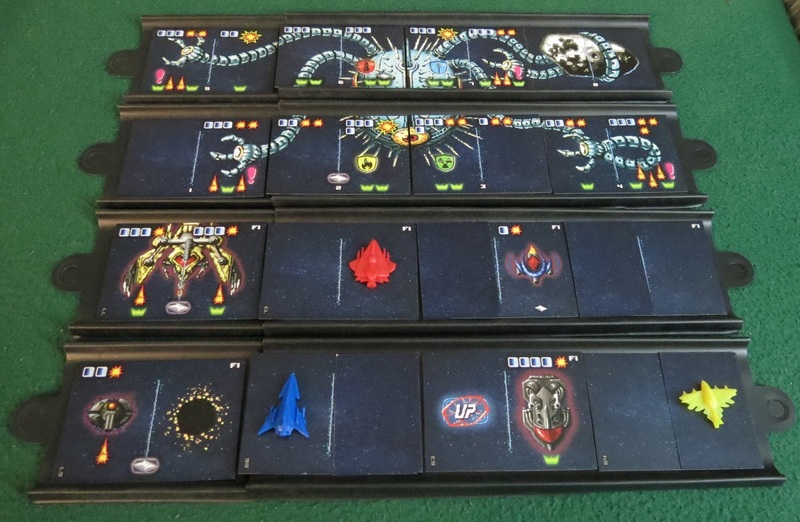 Every round ends with you removing the bottommost tray, sliding the others “down,” and then filling up the newly-placed forward tray with new dangers to confront. Hence, the map scrolls. 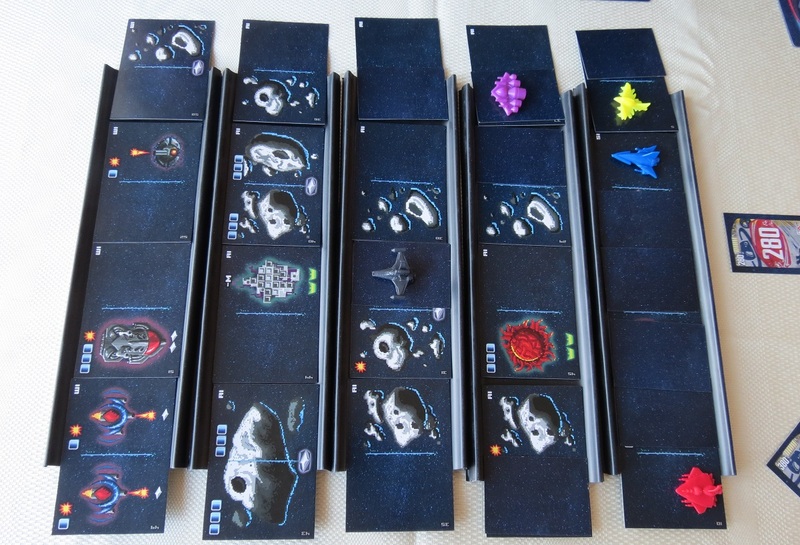 Your little starfighters can even get scroll-pushed into asteroids! Just like in a real shmup! In fact, it does so many things “just like in a real shmup!” that the most heavily abstracted part of the gameplay is the way it handles enemy fire. See, when enemy ships (or turrets or whatever) appear at the top of the screen, they begin firing down at you. And since you can’t actually dodge this fire by jiggling a joystick side to side while peering over the top of your aviators (okay, you can keep the aviators, but be aware that you look like a d-bag), Kemble’s Cascade uses “threat” instead. 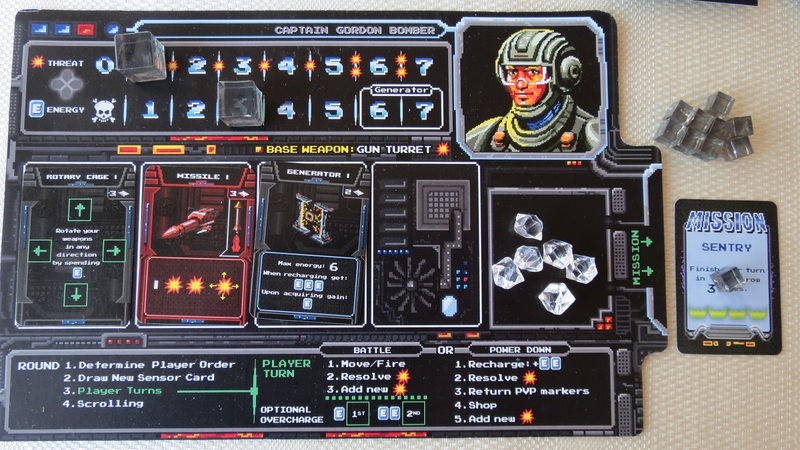 At the end of your turn, each nearby enemy and each shot fired at you generates “threat,” marked on your ship board to represent incoming pew-pew and other dangers. On your turn, each move reduces your threat by one. Each un-dodged threat then drains your starfighter’s hit-points, or “energy” for cool kids. Soon, your starfigher achieves a zen-like balance between pulling off cool maneuvers and surviving. You can only move and fire once for free each turn. If you want to do more, you’ve got to overcharge, which costs one energy for the first overcharge and another two for the second. At first this seems like a raw deal — spend an energy to move again and avoid losing an energy? “Huh?” you say, peering over those aviators again. But after a while the game is about when to use your overcharges, losing an energy to dodge a whole pile of enemy threat that you wouldn’t be able to survive on the next turn, or burning twice to slip next to an alien singularity and blast it with your flamethrower, gaining a bunch of glory before your wingmen/opponents could get into range. The point is, if your goal were mere survival, you could do it without much trouble. You’d never overcharge. You’d sit at the back row, blasting a safe corridor to fly through. But then you’d lose, because the path to victory is to accumulate the most glory, gained by taking risks, darting forward, facing the toughest enemies, and burning your generator until your ship’s something-core verges on implosion. Now and then, even the sexist space-pilots are forced to power down. This lets you gain some energy back and shop for upgrades, stuff like better engines for more free movement, shields to insta-block threats, rotary cages to shoot in directions other than forward, and all sorts of guns. The tradeoff, of course, is that you’re still being shot at by space-badguys, so you’ve got to catch those sporadic windows of calm to recharge. If all that isn’t enough, Kemble’s Cascade has a whole bunch of other stuff going on, like Player vs Player combat (while fighting aliens! ), special squares that give you loads of glory but take lots of shots or movement, minibosses… even death is handled deftly, everyone else alive picking up some bonus glory while you take a breather and re-enter the map at your leisure. It’s a clever system, and my group had a ton of fun messing around with each other, racing to destroy the toughest enemies or capture the most glorious space-mazes or singularities, and blocking each other’s flight paths. In fact, I’ve only got three complaints. First, you’ve got to turn on some sort of theme music to get in the proper mood. Once I put the Guile theme on repeat on my phone, the game clicked and our enjoyment tripled. Second, even though the game comes with multiple “zones” to fly through, from the easy “asteroids” and “squadrons” zones to the ultra-tough “fleet” and “tunnels” decks, as well as four bosses and a whole bunch of power-ups, missions, achievements, etc., it still feels like it’s begging for more expansions to add even more zaniness. Third, and most seriously, it only half-captures the spirit of classic shmups. Where those games relied on reflexes, instinct, and muscle-memory (which is possibly why I always sucked at them), The Battle at Kemble’s Cascade can drag on a bit, especially once you start considering all the ways to spend your overcharges. It never got in the way of my group’s enjoyment of the game, but I think it will for some people. At any rate, The Battle for Kemble’s Cascade is nothing if not novel. Even better, it’s a hell of a lot of fun, as long as you can see past its occasional slow pace. After all, there’s nothing quite like blasting a screen-filling space-slug into oblivion. 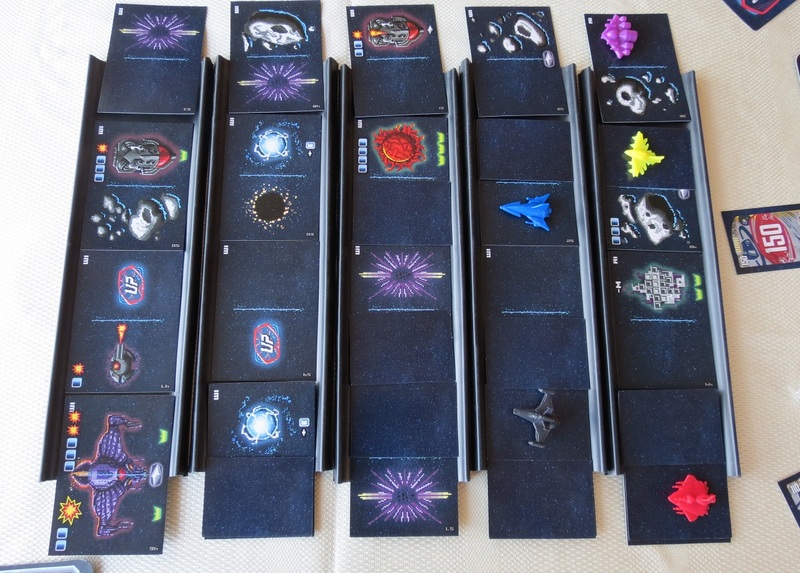 Posted on September 26, 2014, in Board Game and tagged Board Games, GenCon Loot, The Battle at Kemble's Cascade, Z-Man Games. Bookmark the permalink. 3 Comments. I like the option to gain glory through side-missions. It’s a good balancing measure that rules out some of the luck involved with placement. That was the only reason I stayed competitive for a while when we played.